Desk cover all your bases from increasing your agents' productivity, to crunching through performance metrics, to working in sync with other apps that you use, get to the core of.. The Campaigns module allows you to create, send, reach, and track effective email campaigns. This further allows you to build long lasting relationship with your customer. The LiveChat software enables you to start proactive chat with your visitors. As you get in touch with real-time visitors, there are chances of increasing business ROI. The preferred project management software helps you plan project activities, assign work, and coordinate within your team so that the work is completed in the given time frame. Social Media Management Software helps you create your brand presence on the popular social networks. Respond to instant notifications and engage with target audience. Gain real-time insights into your CRM data. Motivate winning behaviors. Broadcast everything on TV. Watch your sales grow. Zoho Reports is a BI and analytics solution that allows you to create insightful reports and dashboards. 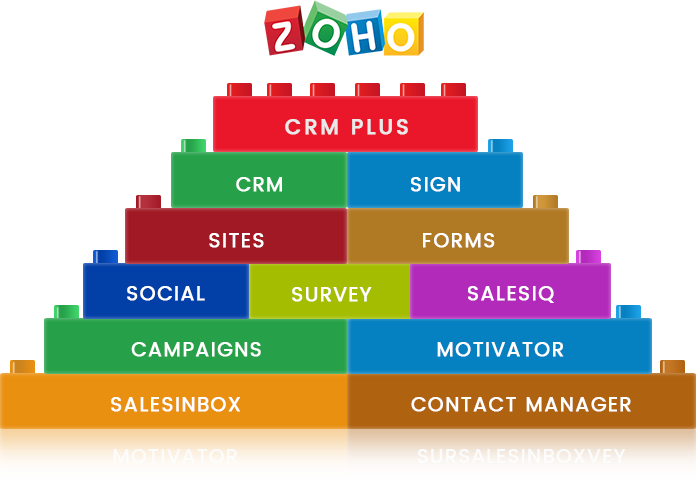 Zoho CRM Plus combines the award winning Zoho CRM along with the best of Zoho’s customer engagement products in one tightly integrated, customer-centric suite. Create accounts, add users, and provide users access to applications. Learn how to use APIs to integrate third-party applications. Find answers to your queries quickly and resolve issues on the fly. Get acquainted with the features of each application and use them effectively. Attend webinars by CRM Plus experts to gain more knowledge and get assistance from them to manage your business.